“If you wanted to work with your hands, you should have become a brick layer and saved yourself thousands of dollars and four years of dental school,” said Howard Farran–noted speaker, media maverick, and recent author of the book, Uncomplicate Business. I could not help but chuckle at this comment and many others from Dr. Farran as I interviewed him recently. Howard says it how it is. Back in 2007 when I became a “Townie,” (someone who subscribes to Dentaltown Magazine), I joined because Howard dares to do things differently. Of course, he gets criticized for this often, and some people say he is too edgy. That didn’t stop me from joining his group nor from reading his book. I appreciate a straight opinion, and, occasionally, I get a bit edgy. Dentaltown’s forum is another one of Howard’s creations. It’s an on-line site for dentists and dental professionals. It’s a place to vent and a place to find help. Some topics I enjoy–others not as much. It does provide a broad spectrum of options, and that is what is appealing. More often than before, I read the monthly edition of Dentaltown on-line, and I comment about the thought-provoking topics. I like to be engaged; I like to communicate, especially after I read something I enjoy or something I may have a difference in opinion. You may just creep on the pages and read in solitude with no interaction. That’s an option, too. Howard acts as a Godfather type figure over the whole scene–commenting and writing as he desires. He often abstains from making any comments when controversial topics emerge. Rather, he supports the freedom of press and lets members write in their pro’s and con’s until some kind of agreement is reached, or until people are tired of reading others’ comments. Howard’s book is definitely worth reading. It speaks to three key areas in any business: people, time, and money. He describes his early beginnings as a young dentist starting out in Phoenix, Arizona. He said his Mom told him to go some place where the sun shines all of the time. He looked for a growing region in the country, paired that with sunshine, and grew an exceptional dental practice. He still practices in Arizona at his office called Today’s Dental. His personal and business stories make this book interesting to read. He offers concrete business advice and provides nice graphics to help understand balance sheets and important numbers to watch. For a more thorough summary of his book, watch my interview with Howard on my YouTube channel. I will tell you to listen to it more than watch it because Howard is a little off-centered in parts of the video, and it can be distracting. My side-by-side recording failed after the test phase. My apologies to Howard for that. The interview is packed with colorful stories, and behind the scenes information about Howard’s inspiration for his book. He also reveals personal tips to help every dentist be better than the day before. You can find Howard’s book on Amazon.com right here. Buy it. You won’t regret it, and then pass it on to someone else. Every dentist knows we need more honest, business advice. 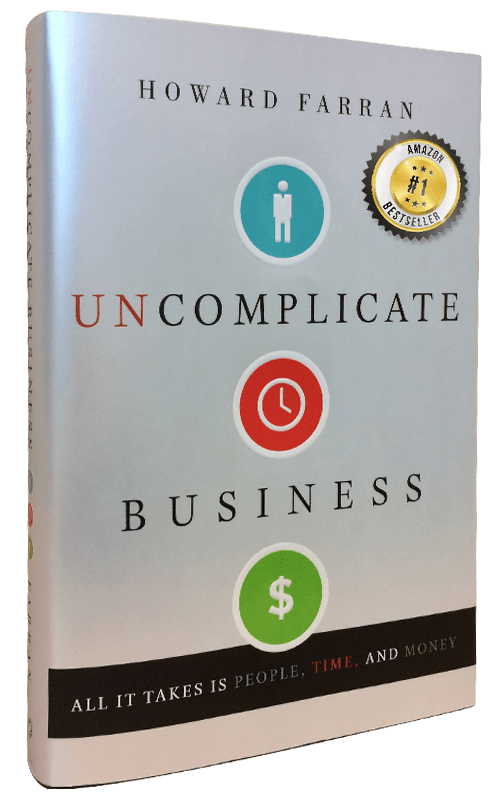 Uncomplicate Business is definitely worth space on your dental resource shelf. Dr. Lisa Knowles founded IntentionalDental Consulting to help dental professionals find more peace and prosperity in the ways they practice. She writes often and reads the works of others in her quest to teach, coach, and mentor her audience with the best materials available. She is an international speaker on the topics of effective communication, oral and systemic health, leadership, and eco-friendly dentistry. Contact Dr. Knowles at 517-331-3688 or email her at IntentionalDental@gmail.com to schedule an appointment or to book her for a speaking engagement.